This is credited as the Second Edition; but it went on sale at Anthrocon 2013, July 4-7, while the Kindle and Smashwords first editions have an August 24 and 25, 2013 publication date. That’s later. Does anyone besides me care about this bureaucratic trivia? This is a good read, in a handy trade paperback edition for those who don’t want to read it on their computer. Get it in one format or the other. But this is a direct sequel to Lowd’s Ursa-Major-nominated Otters in Space: The Search for Cat Havana. If there is any flaw with Otters in Space II, it is that you need to have read the first book to really understand it. Or at least read the review of it, in Flayrah on February 6, 2012. Dallas, TX, FurPlanet Productions, July 2013, trade paperback $9.95 (227 pages), Kindle $6.99. Otters in Space II dives right into the action. The humans have all left Earth, after uplifting the cats, dogs, and otters (and others? squirrels are mentioned) to take over running civilization. The uplift includes intelligence and speech, and the ability to shift between a bipedal and quadrupedal posture, but not size – most dogs are larger than cats or otters, and all are much smaller than humans were. The cats and dogs are uneasy partners in a joint Earth society, while the otters run the orbital space station, the Lunar colony, and what space travel there is. The dogs are the political leaders, despite the cats outnumbering them four to one, and they don’t intend to let the cats share the government. Kipper Brighton is an average tabby “alley” cat office temp working at dog-run Luna Tech, the dog/cat company that deals with the otters’ space civilization. When Kipper’s hyperactive sister Petra tries to start an it’s-time-we-put-more-cats-into-the-government movement, and Kipper learns too much about the cat staff at Luna Tech who have disappeared, she is marked by the canine political bosses for removal. The action leads to the otter-run Deep Sky Anchor space station and the Moonville Funpark Lunar colony, where Kipper searches for “Cat Havana”, the legendary hidden utopian cat society. 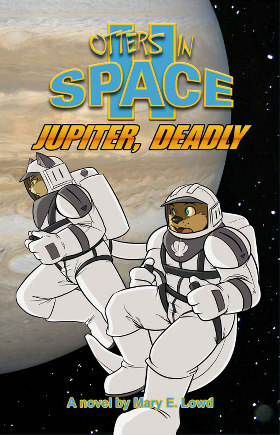 Otters in Space II splits into two stories, in alternating chapters: that of the team of Kipper’s siblings, Petra and Alastair, and their Dog bodyguard/friend Trudith, who are running for office in the animal U.S. on Earth; and of Kipper’s continued exploits in deep space aboard the Jolly Barracuda, an otter merchant spaceship. The more stable and realistic Alastair has taken over Petra’s movement and run for senator of California in the recent election. Despite a massive turnout of cat voters, the dog-controlled government announces that the dog incumbent, Senator Morrison, is re-elected in a landslide. Alastair and the others must decide whether to accept these results, or challenge them and risk setting off a new American civil war between cats and dogs. This story focuses upon the not-very-bright but utterly loyal Labrador retriever Trudith. Meanwhile, Kipper and the otter-crewed Jolly Barracuda, on a supply run to the asteroid belt, find the otter space explorers around Jupiter under attack by mysterious space vessels. The cast’s dialogue is realistic, and both the political scene, and the hard-science astronautics of space colonies and exploration, seem skillfully convincing as modified for intelligent cats, dogs, and otters. Good old Alastair! Trudith knew she was on the winning side. Well, okay, maybe not the winning side. Not yet. But the right one. Although it only took Trudith’s message seconds to reach the Deep Sky Anchor station in Earth orbit and would take another ten minutes to cross the space between there and the Jolly Barracuda, Kipper wouldn’t receive it for two weeks. The Jolly Barracuda flew incommunicado, her flight plans unlogged. Captain Cod felt it was more piratical that way. It took Kipper a moment to see what Jenny was talking about. Crawling along the far wall of the crowded docking bay, just about otter head height, were two ashen gray octopuses. Each octopus had a dull metal tank strapped to the side of its bulbous mantle with a nexus of tubes congregated where the mantle met the arms, completely covering their tube-like breathing siphons. FurPlanet Productions has the trade paperback editions, and Amazon.com and Smashwords have the electronic editions, in print. Get them! Let's see it, by all means! Flayrah will take reviews of the same book by different reviewers, and it will help readers to decide if a book is worth reading if they get a variety of opinions on it.